constructed with a multiple-circuit, blanket-type heating element that is uniformly applied around the crucible. The result is TOTALLY uniform heat – NO hot spots, cold spots or overheating. Temperature controls start the heating element for a quick heat up to maximize your production time. These melters are ideal for use with both wax and gel. 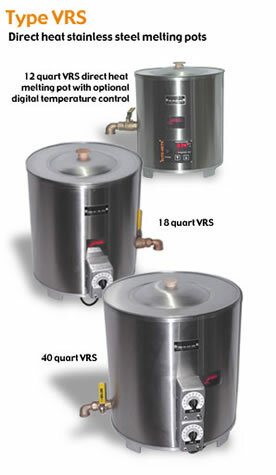 Variable temperature ranges from 60 to 250 degrees Fahrenheit. Our VRS melters, exclusively Rite-Hete products that are manufactured on-site in our factory, offer fast melting, heavy-duty stainless steel construction, heated valve, and dual temperature controls. You can easily mix your color and scent directly into these units, or use them to melt your material. These melters, combined with our EZ Dispensing Systems, make very affordable, efficient, fast filling production systems. Order your system today! Materials with melting points below 550 degrees Fahrenheit. Electronic temperature control 50-250F. 40-410F & 150-550F options are available at an additional cost. 40-410 degrees or 150-550 degrees Fahrenheit also available at an additional cost. Capacity / 2019 pricing (does not include shipping) I.D. 80 quarts / $1470.00 6 3/4 x 7"